Affiliate links are included below. I’m an old-fashioned girl in pretty much every aspect of my life, and vintage baby names have long been my favorite. Every time I see one that I love, I add it to my growing list. When I had Caroline, I had SO many names that I wanted to use–I wish I could have given her three middle names! I’m sharing my list of favorite Vintage Baby Girl names with you, and it was so fun to type them out–it made me baby hungry! Some of these have become more popular over the years, and others still hover below the top 1000. So whether you’re looking for a name that not everyone on the playground will have, or one that’s classic and recognizable, there’s a name on here I bet you’ll love! 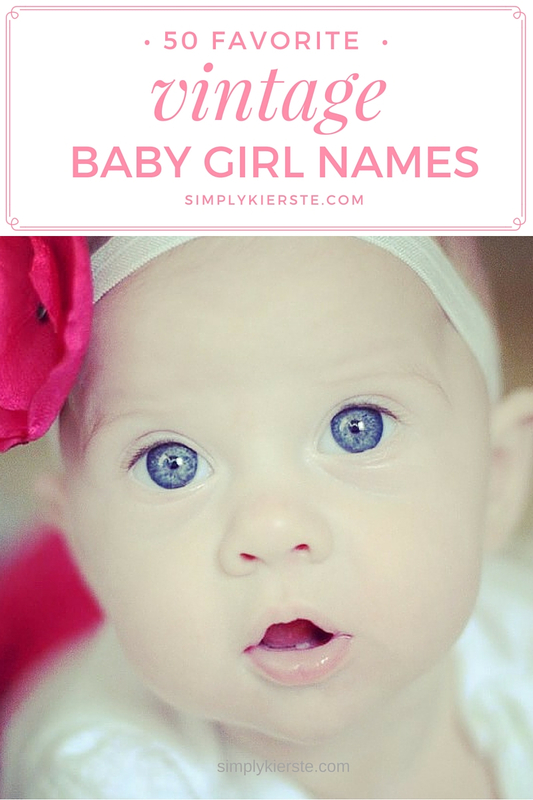 If you have a vintage baby girl name that you love and that isn’t on the list, please leave it in the comments–I’d love to see it. And don’t forget to check out the list of 50+ Favorite Vintage Baby Boy Names! We love ‘vintage’ names, too. Our oldest is named Eloise and our youngest is Margot. Evelyn and Genevieve were also contenders. Oh, I love Margot! Evelyn and Genevieve are also gorgeous names…thank you for adding them to the list!! We named our baby girl Ruth. And everyone we tell it to just gushes how they love it. Such a darling name–thank you for adding it to the list! We have a ruthann, but we call her by her middle name- marie. So cute! What made you decide to call her by her middle name? You have Emma, but not Emilie. My daughter is named after her great-great grandmother who was named after her father, Emil. Thank you for adding Emilie to the list—it’s a beautiful name, and I like the spelling. And I love that she’s named after family! My daughter is named Helen Rosaleen, after 2 of her great grandmothers! Beautiful name!! I’ve loved giving my children a little piece of their ancestry as well. How darling!! I love them together too–so cute!! There are so many lovely old names! You have one of my aunts names, Pearl. Opal and Jean are a couple of lovely names not on your list! Those are all beautiful names…thank you so much for listing them!!! Interestingly, so many of those names are so popular right now! If I had another daughter, I would have named her Mary-Jane. Another name that is cool is Felicia( name of a friend growing up). I love all of those names!!! I love vintage…and was excited to see that most of my girls made your list! :) We have a Meg (Meghann), Em, Claire, Annie and Josie. Yes….5 special girls….of course no drama ever over here! Thanks for your blog….best wishes on your house building. It’s been very fun to watch. We did it four times, loved it…but now want to stay put! I have and Adeline Margaret and a Priscilla Kendrick. As you can tell, I love old fashioned names as well! SO cute! Priscilla is one I didn’t have on the list, so thank you for adding it!! Our now 23-yo daughter is named Sophia Pearl, after her maternal great-grandmother and paternal grandmother, respectively. We love the old-fashioned sound it has. Fortunately, she likes her name too. I just love that name, and it’s even more special since she’s named after her grandmothers! We have Louisa Leigh, Eleanor Grace and Annabelle Marie. I’ve always loved Hannah and Rebekah, as well! Love love all those names!! One of our favourites on our list at the moment is Florence! Hubby totally has his heart set on it! I prefer Matilda so no matter what she will have a vintage name ? Both adorable names! I have a friend with a Matilda and they call her Tilly. SO darling. Yes, LOVE all of those!! I really like Poppy, but my hubby turned me down. Too bad I can’t name them all by myself, lol. I have a Jane. I love the classic, pretty names like these! Definitely rare, classic, and gorgeous! My oldest daughter is Grier (Greer) and my baby is simply, Olive. I love old fashioned and seldom heard names. Oh, I love both of those names!! Adorable! I love Julia, our new baby granddaughter’s name. We have a EmmaLee Kate (named after a grandmother) a Kingston Lee (named after her great grandfather) and a Zadie Grace (named after her great great grandmother) as you can tell we love family names! Such great names!! Family names are the best! My daughter’s name is Ophelia Lavender and we call her Ella. I think Ophelia and Lavender are vintage. And my next baby if it’s a girl will be Eleanora Belle which I believe are vintage as well as Rosemary, Fiona, and Odette. What darling, darling names! I love them all! I adore classic names too and searched the SS index for the 40s & 50s for our names, which are both on your list–Amelia Jane & Annie Layne. ? I love that they’re not made up names but also not too trendy. And that they each have awesomely pioneering women with the same names (I’m a history teacher). Oh and I see Millie on your list–I thought it was mostly used as a nickname for Amelia. Do you know if it was commonly used on its own? Just curious. ? I believe Millie was usually short for Millicent. I have a McKenna! It’s actually Taylor-McKenna, and yes, we call her by her full name. I also have a Sunshine, Krystal, and Kennedy. My boy is Taylor as well, but he has his dad’s last name and the girl Taylor-McKenna has my last name. My sister has Tina,Teri, and Eric. It was fun reading this! Thank you so much for sharing–love all those names! My name is Betsy! Can’t get more vintage than sharing a name with the sewer of the American flag! That’s true!! I love the name Betsy! The cutest names!! Love them all! I have a good friend that is very vintage right down to the way she dresses and she named her girls Ava, Mabel, Mary and Jane…love them! My mom’s name is Nola and I’ve always loved that one too! Oh my goodness, that is too cute! I love every single one of those names! Named my daughter Nettie Elizabeth after two of her grandmothers. Our daughter’s name is hooper from her great grandma. Our daughter’s name is hoper after her great grandma. In Germany its also trendy to give vintage names. A few years ago many kids get an english name. My daughters name is Melissa. Its no big trendy name and in Germany on place 80 of popular names. But I find the name very cute. I don´t really know, if it´s a vintage name?! I think it’s an 80’s vintage name! :) Usually when I think of vintage I’m thinking 1940’s or earlier, but I suppose everyone has their own thoughts about it. Melissa is a super cute name! My daughter’s name is Emmaline! I love the name Emmaline!! So cute! We have a Ruthann Marie (goes by Marie), Vincent Gabriel, Sophie Renee, and David Randall. I love classic names that arent impossible to spell. Jeannette…my grandmothers name. Her sisters were Mary, Grace, Ethel, Martha and Lulubelle.? I luv all of these. I think Lillian should have a spot. I named my baby this after my great grandmother. Those are all beautiful names!! Love them!! I have a Scarlett Charley. I love Mabel too, I just couldn’t convince her dad to go for it lol. I love the name Scarlett, and her middle name is darling! I tried Mabel too, lol, didn’t work! My granddaughters are Franchesca, we call her Frannie. Then we have Bennett, we call her Benne. On the way we have Abilene, we plan to call her Abby. Oh my goodness, I adore all of those!!! SO cute! My daughter is Sadie Amelia. She’s 10 so it really wasn’t a trendy name then. She’s named after my ancestor Sadie Nell. Being named after family/ancestors is the best! Love! We are naming our first daughter Felicity! If we ever have a second she’ll be Amelia. My not quite 2 year old daughter is Marion Elaine. She is named Marion after my grandfather who was named after his mother. My other great grandmother was also named Marion. Her middle name, Elaine is for her grandmother and also both of her great grandmother’s on her father’s side. The name Marion is just beautiful. You don’t hear it often, which makes me love it even more! My Daughters name is Stephanie Nicollette after my grandmother. If I have another girl I will name her Harlow Scarlett. I love vintage names! My daughters are Edith “Edie” Brooke, and Quinn Elizabeth. Oh, I love Edie and Quinn!! SUPER cute! I don’t have a girl but love the name Sylvia. It is also a family name. Love this! Such gorgeous names. My sisters and I obviously share a love for vintage, as our girls are Nora, Mia, Elizabeth, and Evelyn. Our short list for more girls has family names like Elaine, Hattie, Helen, and Sophie. Can’t wait for your boys list!! I love every single one of those names!! Beautiful! Love vintage. I had a Great-great Aunt Rosine ( Rose-een). Loved her name, but I had boys. My sisters are Josephine & Dorathea and I’m Danniela (Dah-niela) German pronunciation. I already have a Sadie and a Violet! My grandmother’s name was Ann Elizabeth, but she went by Annie. I think her name is so beautiful. I named my daughter Kaystin Elizabeth.